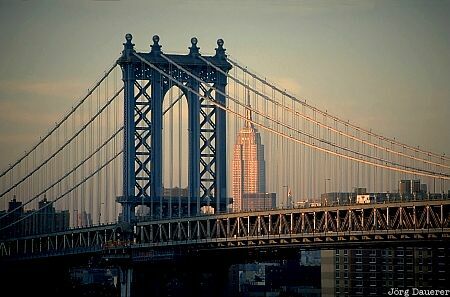 The Empire State Building in midtown Manhattan and the west pillar of Manhattan Bridge seen from Brooklyn Bridge. The use of a 200mm lens gives the impression that both New York landmarks are close together. Manhattan is in New York City, New York on the east coast of the United States. This photo was taken on a sunny evening in October of 1997. This photo was the image of the month in January of 2014.